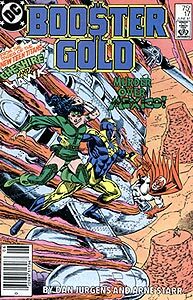 Cover Description: Booster Gold struggles to save Hawk and Cheshire from a flaming military helicopter falling towards a lone figure in the Mexican desert. Brief Synopsis: Booster oversees the growth of B.G.I. and defends the world against a rogue scientist. The sign on the wall of U.S. Biotech has been changed since the events of the last issue to include the phrase, "A B.G.I. Company." U.S. Biotech must be into some serious projects; the guards for the building carry sub-machine guns. Skeets relays that Cheshire is 5'9" tall and weights 135 pounds. That height/weight combination indicates that Cheshire has a Body Mass Index (BMI) of 19.9, a nearly ideal combination of height and weight which would be expected on a world-class assassin. Skeets indicates that U.S. Biotech is located in Arizona. In the 1980s, Arizona was on the early upward curve of explosive population and economic growth that continues to the modern day. Skeets is aware that Hank Hall is the Teen Titan Hawk. Since Hawk's civilian identity was not common knowledge, either Skeets has some very advanced scanning technology, or Hall's alter ego is known in the future. Arriving in Mexico City, Booster reveals that in the year 2462 Mexico City will be a beautiful metropolis, not the sprawling slum that it appeared to be in 1987. By the year 1990, Mexico City had well over 8 million residents within its city limits, and an estimated 19 million in the greater Mexico City region, making it among the most populated cities on Earth. After failing to get Captain Revez of the Mexico City Police to search for Babich, Booster makes his appeal to Revez' Commissioner. Both men wear the same uniform: white suits with loud, yellow, red, and green polka-dotted shirts. This is more likely an error of the colorist, Gene D'Angelo, than an indictment of the Mexico City Police Department's sense of fashion. Booster saves Hawk in the nick of time. This is the first meeting between the two, and Booster introduces himself. Seen for the first time, Cheshire's stealth helicopter appears to be an AH-1 Cobra, an American attack helicopter used in multiple branches of the U.S. Armed Forces. The AH-1 was first used during the Vietnam conflict and remains in use today in limited numbers. Military forces around the world now use variants of the design, but it has never been in use by Soviet forces. Booster saves Cheshire from a helicopter crash. This is the first meeting between the two. (Booster meets more people that way.) 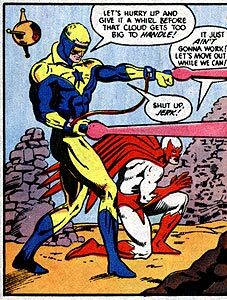 Booster is saved from introducing himself again when Cheshire's Soviet boss identifies him as "that attention-starved capitalist American super-hero, Booster Gold." POWER UP: Booster and Skeets rewire Booster's force field to create and external containment field for the released bacteria. Shrinking the containment field will increase the pressure and heat on the bacteria, eventually killing it. This process brings to mind the danger of such a force field if used by someone with less heroic intentions than Booster. Booster threatens to murder Cheshire if she doesn't provide an antidote to Hawk for her poison-laced fingernails. That's right: murder. Very heroic, Booster. Boosterrific Review: Two issues ago, Booster Gold was hunted as a diseased terrorist, and now he's hunting terrorists who spread disease. That's probably the least strange thing about this issue. Booster is uncommonly derogatory, calling Teen Titan Hawk a "worm," Trixie Collins dating Dirk Davis, some heavy-handed lecturing about Communism and poverty, and a bizarre case of multiple Mexicans wearing identical tropical shirts. (The last is probably the work of poor editing, though something about Arne Starr's inks doesn't sit right either.) To clarify, this issue isn't bad, it's just unusual. I wasn't a big fan of this issue. Booster just seems incredibly angry throughout the entire comic and finishes it with a rather unheroic move. Also, while Booster himself doesn't much involve himself with politics, the comic straddles a thin line by associating Hawk's conservative views with the same views of the vast right-wing scientist, despite his not knowing the truth, and especially in thanks to Booster's jerkish treatment of Hawk. Trixie and Dirk? Are you kidding me? I think Booster not getting along well with Hawk makes a lot of sense and it reminds me of Booster's relationship with Magog down the road.